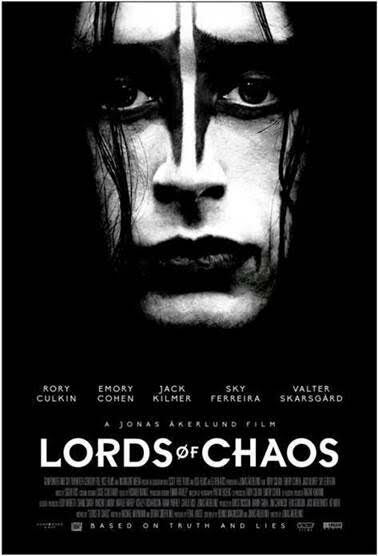 Jonas Åkerlund's THE LORDS OF CHAOS is the story of the Norwegian black metal group Mayhem. They wanted to be dark and depressing and truly satanic and then things spun off into suicide mayhem and murder. The film has Rory Culkin as Øystein “Euronymous” Aarseth who along with his friends form the group Mayhem. He is the narrator of the tale and it is through his eyes we watch the band grow in stature and begin to drift toward the dark side. 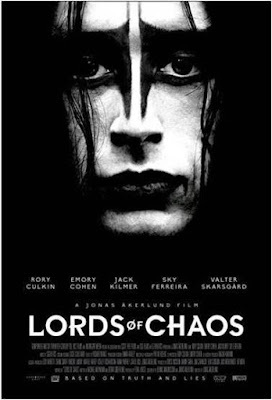 Emory Cohen co stars as Varg Vikernes a one time fan that Euronymous pushed toward darkness by calling him a poser. Varg would eventually join the group in the wake of their lead singer's suicide. It is a move that would speed the group toward crime, tragedy and death. A hypnotic film it walks the fine line between horror, bio and satire as the guys try to act according to their black metal philosophy, yet often have normal lives. Varg's and Euronymous' families take their life style in stride while going on as if they aren't different. Actually much of society really doesn't pay them much attention until Varg begins to burn down churches. We also watch the transformation of Euronymous from straight up rocker to record executive as periodically we sits a typewriter with nerdy glasses on and fires of a letter. Life is certainly strange. It is one hell of a ride. The film seeks to explore notions of alienation and dark outsider culture through the black metal scene however I'm not sure the film really hold together straight on to the end. While the film does tell the story of the dance between Varg and Euronymous that would lead to murder, there is a point around the third act where the film kind of becomes a straight retelling of events. It does keep us interested, but it kind of loses the weight of having a point. While I knew why director Åkerlund was telling the story for the first 70 or so minutes In the final half hour I wasn't so sure (more so since I'm not sure the final bit of narration jibes with the scene before it). It's not fatal but it made a great film just a very good one. Unseen Films writer Eden Miller who is a fan of black metal and familiar with the music presents her take on the film here.